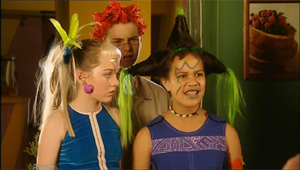 Cloe first appears in series one episode one. According to Tribeworld Cloe is a slightly withdrawn loner who initially relates better to animals than to people. Not very practical in other ways, she can be a source of irritation to the others by neglecting her duties to deal with her own crises, of which there seem to be many. But her moans and melodrama are often no more than a source of refuge from the alien, dangerous world outside, and her fears for the future. In series one Cloe is rescued by Amber and Dal and, together, they take refuge in the Mall. She quickly befriends Patsy and her twin brother Paul. As one of the youngest member of the Mall Rats she struggles with her new life without any adults. She often looks for motherly comfort from Salene and Amber. While Patsy has her brother, Cloe feels she has no one to count on. She finds a calf that she names Bluebell and starts spending more time with her than with the tribe. When Lex threatens to eat Bluebell, Cloe tries to free her, but ends up getting lost. She is rescued by Tai-San and brings her back to the Mall. Cloe consoles her best friend Patsy when Paul disappears. She promises her they will always have each other. When Amber leaves the mall with Sasha and Salene starts suffering from bulimia, Cloe feels abandoned. She finds some stolen bottles of water in Bray's room and feels conflicted between her affection for Bray and his betrayal, still Bray is proven innocent. When Patsy brings back a contaminated Glenn to the mall, Cloe must reassure her she is not guilty of bringing the virus inside. They promise each other they will beat the virus together. When the Tribe Circus invades the mall, Cloe and Patsy decide they are not children anymore and they fight alongside the other Mall Rats. After the Mall Rats trek to Eagle Mountain and find no antidote, Cloe and Patsy are afraid they will be left alone, but Salene and Ryan promise them they are a family now. In series two after Tai-San finds the formula, Cloe helps the Mall Rats with the distribution of the antidote. Brady is kidnapped under Patsy's surveillance and Trudy is furious at her. Cloe is worried after Patsy goes missing and blames the other Mall Rats for not looking for her. Ebony and her troops finally find Patsy and Cloe tries to reassure Patsy and promises they will find Brady. After their dog Bob is killed with poison, Cloe and Patsy feel all alone again and distance themselves from the Mall Rats. They think the others do not take them seriously and, for a short period, they decide to form their own tribe, the C and P tribe. When Trudy comes back to the mall with Brady, Patsy feels so guilty she starts spending all her time with Trudy. Cloe feels abandoned once more, as she was when her parents died. She is the only one who realizes Trudy has changed and tries to warn everyone. After Cloe notices Brady is not the real Brady, Trudy threatens her, and Cloe is afraid. After Trudy reveals she has become a Chosen, Patsy apologizes to Cloe and, the two make up. In series three after the mall is invaded, Cloe agrees to join the Chosen in order to spy on them for the Mall Rats. She wants to help defeat the people who have taken her home from her, but is caught spying and sent to work in the mines. She is freed later in series three, when the rebels defeat the Chosen. She encounters Jack and together they go back to the mall. She learns Patsy was sent to the mines as well, but that no one has heard from her since. During her captivity Cloe has grown up a lot and is much more self-confident. KC seems to notice the change and starts to have a crush on her. In series four Cloe sees the Techno's plane, she thinks the adults have returned and is relieved. But when they invade the mall and start kidnapping all the Mall Rats, Cloe hides under her bed. The other Mall Rat's return and she tells them what happened. They all decide to confront the Technos, but their technology is too advanced and the Mall Rats have to surrender. Cloe becomes moody and refuses to help out at the mall. She develops a crush on the much older Pride and is hurt when she finds out he does not reciprocate her feelings. Cloe soon starts a relationship with the Techno Ved. Although Ved often treats her badly and everyone advises her to stop seeing him, she falls in love with him. When she thinks she is pregnant, Ved breaks up with her. After Amber asks for her help, she agrees to use Ved to get information on the Technos. Ved realizes Cloe used him, but he has begun to care deeply about her and forgives her. Cloe trusts Ved when he asks if she wants to try Ram's new virtual reality game, but she goes missing in the game. Ved learns that Ram deleted Cloe because he was sick of their relationship. Ved challenges Ram to a duel to get her back, but he loses and Ram deletes him. Cloe is never seen again. Cloe is seen wearing a number of outfit's on the show. The first one we see her in is a cotton navy blue dress, with cream and brown patterns forming around the bottom of the dress. The dress also has two buttons at the front. She wears a pair of short jeans underneath the dress and a red jacket outlined with another pattern like a zigzag. Cloe series two outfit is a short blue top, with a purple pattern forming across the chest, it also has two flaps that join together on each shoulder. She wears a pair of black jeans with this outfit and a red belt with colourful shorts over the top these have a mixture of colours through them. Cloe wears a light blue hooded jumper with this outfit when outside, this jumper is lined with a leopard pattern. On her upper arm she wears a bright green and yellow flower and leave piece, held on with elastic. Cloe's series three outfit is a dress, this dress has a mixture of light and dark colours of browns and yellows. The dress has a brown circle on the front, and a green fluffy collar, this dress does up at the front with a silver zipper. Under the dress Cloe wears a pair of brown 3/4 pants, these have a split at the side of each leg. Black boots are worn with this outfit. Cloe's series four outfit is a blue top worn under a yellow corset. The corset has a number of silver zippers that go along the chest around to the back. A purple coat this outfit it has two silver clips on the collar and a black zipper at the front. This is worn with long black pants, and a black belt is worn with the pants. The belt has a silver buckle. A pair of dark brown boots go with this outfit.